In 2014, Liz Thames and her husband, Nate, were a conventional young couple working nine-to-five jobs in the city. But they dreamed of another life, setting up home in the woods of rural Vermont while no longer having to rely on a monthly paycheque. 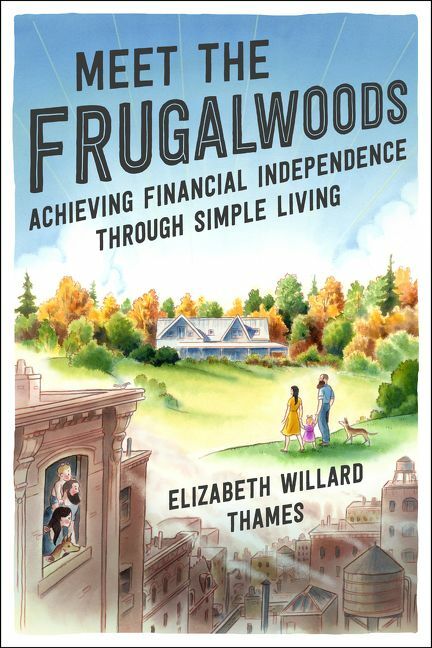 Meet the Frugalwoods: Achieving Financial Independence Through Simple Living is the story of this transition. Thames describes how she and her husband embrace simplicity and turn their backs on keeping up with the Joneses. She sets out a familiar world of office job monotony, with weekends constituting “a race to prepare for the next week”, before sketching out a route towards a different way of living. The answer the couple fix upon is to use extreme frugality to enable them to become financially independent and begin a new life in the woods. I wouldn’t say this is a perfect book. A thoughtful disclaimer in the introduction, in which Thames acknowledges the privileges she and her husband have enjoyed which made their financial journey easier, can sometimes jar with passages in the book striking a different tone. Other attempts at humour can also be a little hit-and-miss on occasion. At one point early in the book, Thames describes at great length how she has been wanting then-boyfriend Nate to propose, to the extent that she makes a list of baby names that sound good with his last name. He then takes her for a walk while acting strangely and carrying a mystery bag. It would at least make a more interesting plot twist than what we know is inevitably coming. But many passages are hugely evocative and skilfully woven. “Consumerism made me into an insatiable, grabbing taker, whereas frugality transformed me into a mindful, grateful giver. Meet the Frugalwoods has come in for criticism from some in the financial blogging community. In her book, Thames does not reveal what the couple earns. Some argue that without spelling out the importance of a high wage, the reader is left in the dark about a major aspect of becoming financially independent. Others question whether this is a true FIRE (financial independence, retire early) story when, even after the couple’s transition to a life ‘independent’ of jobs, both appear to continue working in some capacity. I’d question both of these criticisms. Firstly, this book’s strength lies not in its usefulness as a how-to guide but as an inspirational story. It is a memoir, not an instruction manual. What financial details Thames wants to keep to herself is her business. Secondly, financial independence doesn’t have to mean giving up work forever. It’s about giving up the need to work. This is at its heart a story not about the numbers but about a couple’s experience in stepping away from consumerism and finding freedom, rather than deprivation, as a result. While in my view it has its flaws, it still has a great deal of inspiration to offer anyone who seeks a different type of life. I was sent a complimentary review copy of this book.